Glencoe's Introduction to Computer Science Using Java provides students with a highly visual way of learning Java programming. 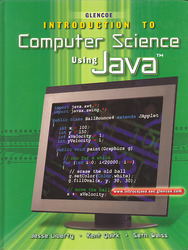 This colorful text provides the information needed for students enrolled in Computer Science I courses, and for students planning to take the AP Computer Science A exam (which has recently switched from C++ to Java). An AP correlation chart is provided in the student edition to help readers locate information that is relevant to the A exam, and AP Exam Prep exercises throughout the book help students prepare for the AP test. The available Teacher Resource Manual also provides AP information and resources for teachers, and links to important AP sites can be found on the book's Web site. The textbook immediately introduces students to concepts that are essential to object-oriented programming and develops these concepts throughout various code programs and examples. Programs are examined line-by-line through in-text code blocks. Complete programs are then provided for students to compile and run. The output for every program is also provided either in the book or on the teacher CD so students can see what happens when the code is run. Careers and Computers articles help students understand how computers and technology can play a significant role in their professional lives and to recognize the variety of career opportunities available to people with computer skills. Ethics and Computers articles inform students about ethical and moral issues related to programming and guide students to appropriate ways to handle situations. Computer Concepts articles expand on interesting computer topics, and provide practical tips and points to consider. Practical information helps students improve productivity and better understand how to perform specific skills. Computers and the Future articles focus on upcoming technologies and developments related to computer science and programming. Key Terms: Important vocabulary terms appear in bold throughout the text. A definition of each key term is provided in the glossary at the end of the student edition. Sidebars: A sidebar feature appears throughout the text. Sidebars extend student knowledge by expanding topics presented in a section. Boxed Items: Boxed items emphasize important Java concepts. Code: Text includes narrative code (code included in running text to illustrate a lesson), Listings (complete code programs that the student can enter and run). Output for the code is usually provided in the form of screenshots. These outputs help students to see what the code should produce when run. Margin Exercises: Easy-to-find cyan exercises located in the text’s margins encourage students to work either individually or in groups to understand major concepts presented in a section. Many of these exercises address topics covered on the AP A exam. Figures and Tables: Each Figure and Table includes a short caption and a question to reinforce student learning. Topic Checks: Each section concludes with a Topic Check. Topic Checks help students review the material covered in each section. Chapter Opener – The chapter opener prepares students for learning a specific topic. Chapter Overview. The Chapter Overview provides students with a brief introduction to the topics they will learn in the chapter. Objectives. A bulleted list of chapter objectives focuses student’s attention on what they will learn. Think About It. Each chapter begins with a teaser question to get students thinking about information related to the chapter. Summary. The summary includes important points covered in each section of the chapter. Key Terms. Each bold key term is listed alphabetically followed by the page number where it appears in the chapter. Reviewing Key Terms and Key Facts. These exercises review vocabulary and basic concepts covered in the chapter. Understanding Key Concepts. Two or more questions that allow students to demonstrate knowledge of key concepts by completing written reports, hands-on computer exercises, or other types of short projects. Applying Technology Skills. At least five projects that allow students to demonstrate comprehension of key concepts, practice programming skills, and apply code knowledge creating programs. Unit Projects. These projects provide hands-on opportunities for students to apply programming concepts and skills learned in the unit. Discuss and Present. Group learning opportunities where students discuss programming issues in small groups and present their findings or conclusions to the class. Research and Report. Individual or small group research projects where students examine programming concepts or processes and create reports or presentations.